So, as she's jokingly said, "I'm just your basic Hijabi Zorro." There will be other athletes in Rio who are better known than Muhammad, though she is a legitimate medal hopeful in the team and individual sabre events. But it is hard to think of anyone whose symbolism is more important. She has taken her messages of tolerance and what life as a Muslim-American woman is like everywhere she goes, be it "The Ellen DeGeneres Show" (where she did a hilarious fencing demonstration with DeGeneres' sidekick Andy Zeron), to interviews she did after she was named to Time Magazine's list of the 100 Most Influential People in the World for 2016. In February, she was invited to a private meeting that President Barack Obama held with other prominent Muslim-Americans before he gave a speech at the Islamic Society of Baltimore, his first visit in office to an American mosque. "Where's my Olympian? Stand up," Obama said before his talk, scanning the audience of hundreds that Muhammad was sitting among, wanting her to rise and hear the applause. She constantly says, "I'm blessed to be in this position." Muhammad prefers to emphasize positive examples like that when describing what her path to the Olympics has become. But she does not shrink from asserting Muslims and minorities should enjoy the same rights and protections in America as anyone else because, "I feel like I owe it to my community, I owe it to people who look like me and fight struggles every day, to hear something different. It's up to all us to combat these things. I have to speak up because I know there were people before me that did it." And this: "I wasn't going to allow other people's misconceptions to change my journey." So, when reporters inquire about what kind of online harassment she receives on her Twitter or Instagram accounts, Muhammad smiles and says, "Oh, sure, there are internet trolls everywhere. But that's what the delete button is for. And I use it." 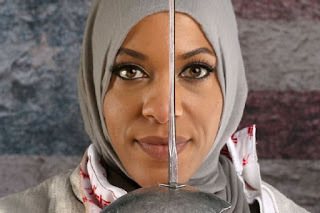 If asked for examples of prejudice she's experienced, she often diverts the discussion instead to the "hundreds of positive messages that cancel them out," or how after taking up fencing for the first time as a 13-year-old girl, she felt wearing the masked headgear and full-length uniform that covered her body had much the same effect as wearing the hijab: She feels it "liberates" her. Rumana Ahmed is the daughter of Bangladeshi parents raised in Maryland, close to Washington D.C. As a kid, you could find her at the basketball court. She also loved traveling and hanging around with family and friends. Everything went well but things changed after the attacks on 9/11. There were days when her identity as a Muslim American became a struggle. She was a young girl wearing a headscarf, but people threw names at her and were saying all kinds of things only because she’s a Muslim. But Ahmed said she never had an issue with it. As a young girl who was once mocked and called names, she never thought about the fact that she could end up working at the White House wearing a hijab in the West Wing. At first, she didn’t aim for a government job, but everything changed after she heard current president, Barack Obama, speaking about hope and change. In 2009, she started working at the White House as an intern in the Office of Presidential Correspondence. Later she got promoted as staff in the Office of Public Engagement. She worked on the Champions of Change program and was trying to uplift and empower everyday Americans. Nusayba b. Ka‘b al-Anṣārīyya (d. 634). Also known as Umm ‘Ammara, she was a member of the Banū Najjār tribe and one of the earliest converts to Islam in Medina. As a Companion of the Prophet Muhammad, there were many virtues attributed to her. She is most remembered, however, for taking part in the Battle of Uhud (625), in which she carried sword and shield and fought against the Meccans. She shielded the Prophet Muhammad from enemies during the battle and even sustained several lance wounds and arrows as she cast herself in front of him to protect him. It is said that after she sustained her twelfth wound, she fell unconscious and the first question she asked when she awoke (a day later in Medina) was “did the Prophet survive?” a testament to her loyalty and commitment to the new faith. Here is one of my favourite stories about Prophet Muhammad. It is noted in a hadith that he and several of his companions were sitting down along a street in Medina. Suddenly, a companion spotted a funeral procession approaching the group. In respect of the dead human body, Muhammad stood up as the procession crossed in front of him. At that moment, a companion, who was still sitting down, said to the Prophet, "This is a funeral of a Jew. He is not a Muslim." Upon hearing these words, Muhammad became upset and said to the companion, "Is he not a human soul?" The message here is clear: Prophet Muhammad respected human beings irrespective of their religion. He taught mankind that every human soul is important, whether alive or dead. This is Muhammad’s concept of dignity. He defended humanity. Unfortunately, the self-proclaimed Islamic State (IS) militants or their sympathisers do not care about humanity. In fact, they are the antithesis of humanity. In the very city where Prophet Muhammad stood in respect for the Jewish funeral procession, several people claiming to be Muslims blew themselves up at the Prophet’s mosque, one of the two holiest sites in Islam. The suicide attack killed four members of the Saudi Arabian security force. In comparing the two events, we can see that Prophet Muhammad honoured people who have passed away, while IS and their sympathisers are the reasons why funeral processions happen in the first place. Any person in their right mind understands that there is nothing "Islamic" about blowing yourself up and murdering other people. After all, the Quran is unequivocal: "You shall not kill yourselves" (4:29). Suicide is so far outside the boundaries of "normative" Islam that some people – Muslims and non-Muslims alike - have started to seriously question whether IS and their sympathisers are "anti-Islamic", and not simply "un-Islamic", as they are popularly described. There is a difference between these concepts. "Un-Islamic" means that Muslims are acting in a way that opposes the basic principles of Islam. "Anti-Islam" means that the actions of some Muslims are actually a threat to other Muslims and to the very essence of Islam – mercy, compassion, justice and peace. We can notice Prophet Muhammad‘s love of humanity in how he instructed his followers to respect the People of the Book, as commanded in the Quran. In the year 622CE, the Prophet produced the Medina Charter, also known as the Constitution of Medina, which contained the rights and responsibilities of the Muslims, Jews and other tribal communities in Medina. As the head of state, Muhammad guaranteed all citizens of the city the rights of freedom of religion and freedom of conscience. The charter declared that Muslims and Jews were equal members of a new political community. Indeed, even polytheists were granted equal rights. Moreover, Muhammad’s constitution did not treat Jews as a monolithic entity; he recognised and respected their ethnic and cultural diversities. All Jews were granted the rights of freedom of movement, freedom of worship and the freedom of assembly. Some consider the charter to be the first written constitution in the world. Whether or not that is true is besides the point – the document is a 7th century model for religious pluralism and civic rights. Muhammad envisioned a society where people were united not by race or religion, but rather by citizenship rights. Jews were not the only religious community that Muhammad peacefully reached out to in Medina. In 631CE, he sent letters inviting various communities of the region to his city. One group, the Najran Christians of modern-day Yemen, travelled 450 miles to meet the Prophet and his companions in Medina. The Christian delegation consisted of about 45 scholars and 15 assistants. After their diplomatic meeting, the Najran Christians needed to pray. They exited Prophet Muhammad’s mosque and headed towards the street, aiming to pray there. Uncomfortable with the idea that his Christian guests had no place to pray, the Prophet told them that they could use his mosque to worship. The Najrans accepted Muhammad’s offer. An important bridge was made that day between Muslims and Christians. And it is these kind of interfaith bridges that IS and their sympathisers want to destroy. David Wright, spokesperson for BAIR, said he was “going to start doing something about Muslims… now”. That’s code word for “I’m going to threaten Muslims with violence”. Clearly, members of BAIR are misinformed and uninformed. One member told AJ+, “the next step in jihad does not involve random, sporadic attacks… They start killing people”. Actually, no. That’s not true. I teach the course “Muslims in American Society” at Rice University in Houston, not too far from Irving, where BAIR is based. Our class, composed of Muslims and non-Muslims, takes a careful look at the various dimensions of jihad. The students, I should add, get alone perfectly fine despite coming from largely Christian and Muslim backgrounds. Jihad has many meanings. It’s often misinterpreted to mean “holy war”, obvious in the case of BAIR, but jihad really means “to struggle” or “to strive”. A jihad might be waking up when your alarm goes off in the morning. A jihad might be putting up with an annoying relative on a holiday. A jihad might be turning the other cheek when blatantly Islamophobic groups like BAIR openly call for the murder of Muslims. It’s true there is an offensive or “violent” form of jihad, but it’s for purposes of self-defense. The Quran, the Islamic holy book, calls on Muslims to “jihad” against the use of violence. The Quran (5:32) states, “if anyone slew a person unless it be for murder or for spreading mischief in the land it would be as if he slew the whole of humanity: and if anyone saved a life it would be as if he saved the life of the whole of humanity”. In another Quranic passage (2:190), Muslims are told, “fight in the case of God those who start fighting you, but do not transgress limits (or start the attack); for God loveth not transgressors”. For those Muslims and people of other faiths who lost loved ones in the recent tragedies in Baghdad two days ago, in Bangladesh last Friday, in Istanbul the day before that, in Lebanon and Afghanistan last week, and in Yemen and Orlando last month, I am deeply saddened and can only offer my prayers, even as I am painfully aware of my state of utter helplessness at what has befallen our global community. As I write this, I learned about yet another bombing outside our beloved Prophet’s mosque in Medina, as believers were about to break their fast yesterday, unjustly killing four innocent security guards. Fortunately, due to the blessings of the place, the sound of the explosion was thought to be the boom of the cannon used to announce the time has come to break the fast, so the people in the mosque were not frightened nor panicked. 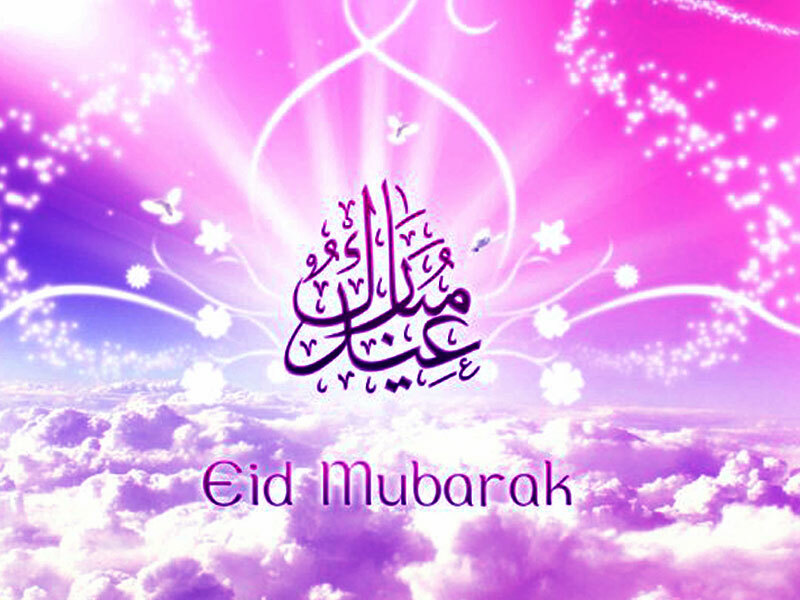 The Prophet, God’s peace and blessings upon him, said, “Whoever frightens the people of Medina has the damnation of God, the angels, and all of humanity.” Needless to say, the horror of these atrocities is compounded because they are being carried out—intentionally—in the blessed month of Ramadan. I found this very inspiring. Never heard such an inclusive interpretation of a Surah. Do check these our very short by useful lectures on various surah. "Some years went by, and I happened to be in Rome staying with some Italian friends when my host asked if I would like to visit the Pope. Of course, I was thrilled. When His Holiness suddenly addressed me, asking if I was a Catholic, I was taken aback for a moment and then replied that I was a Muslim. What possessed me I don't pretend to know, as I had not given a thought to Islam for many years. A match was lit, and I then and there determined to read up and study the faith.